While there is a long list I could rattle off about the beauty of Marfa, the real appeal lies in its secluded location. That and its unique ability to attract renowned artists to reside or create there. It's a become an enclave of sorts for creatives and celebrities (Solange was there the week before I was) who want to experience its charm. For me, it was the uninhibited skyline and skyscraper-free horizon with nothing but miles of golden landscape surrounded by mountains that took my breath away. I was invited on a 48-hour getaway with Chevrolet to take the three-hour drive in their all-new 2018 Equinox from El Paso airport to the quaint destination. While I didn't have as much time as my co-worker Kat Collings on her recent three-day trip, I still managed to see (and do) a ton in this must-see Texan town. So here are some of the best things to do in Marfa in 48 hours (according to me). 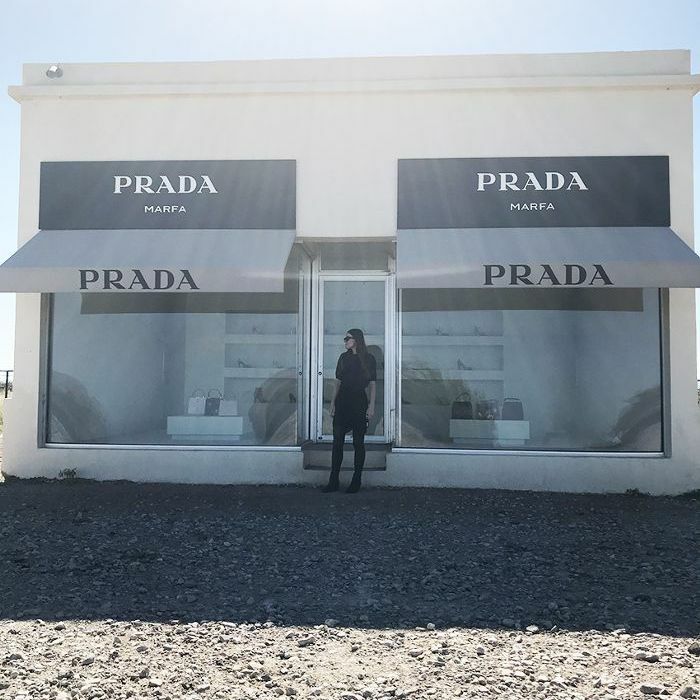 Why Go: If there's one place that put Marfa on the map, it's the iconic Prada Marfa. I was super lucky on my drive in to have the whole place to myself. It's typically crowded with tourists getting their selfies out front, but I had 15 magical minutes to explore and experience this wonderful artifact alone. I loved it. Just the sound of the breeze and the crickets in the golden fields to accompany me. Insider Tip: Don't be fooled by its retail appearance. This is a clever art installation that sits pretty in the middle of nowhere, literally. The only shopping you can do at this store is the window variety, but it's just as satisfying, if not more. Head around the back of the building for the lock fence (it's almost just like Paris). Why Go: If you've always been fascinated by the extraterrestrial or wondered if life exists outside our planet, then you'll be astonished by the famous mystery lights and maybe even believe it does. Since the 19th century, people have been traveling to this historic site to witness this phenomenon, and it is unexplained to this day. According to Visit Marfa, the "seemingly sourceless lights dance on the horizon southeast of town, an area that is nearly uninhabited and extremely difficult to traverse." The lights are sporadic and jump up and down on the horizon appearing as white, red, and sometimes blue in color. No one knows why or where they come from, although there are many stories, it's a beautiful site to see surrounded by the beauty of the Marfa landscape. Insider Tip: Download a star map app so you can identify all the magical stars, planets, nebulae and more in an open sky that goes for miles and miles, uninterrupted by the light pollution of the city. It's a spectacle beyond the marvel of the lights. Why Go: I was lucky enough to be invited to the Julie Speed Studio for an up-close view of her stunning and incredibly detailed paintings. It wasn't just the works that left me awestruck, but the energy of this creative space was incredibly inspiring. You can't see in this photo, but the corner behind me was filled with paint-covered easels, her artist tools, and instruments all laid out as though she'd just wrapped up a sitting that afternoon. To have the privilege of meeting her and enjoying a meal here was such an honor. Insider Tip: Enjoy the serenity of her property. The front yard has views of Donald Judd's concrete works at the Chinati Foundation. It's a breathtaking view. Why Go: If there's one place you simply must see in Marfa, it's the Chinati Foundation with its 15 untitled works in concrete by artist Donald Judd from 1980 to 1984. Located on an old army base (the old barracks have been turned into galleries), this is just one of many large-scale installations on the property, preserved and revered for all to see. We walked through the property to view these concrete structures up close, and we were overwhelmed by the way the light changed and morphed into various shapes throughout the tour. And if you're lucky, like we were, you may come across some of the locals. And we're not talking people either. Some very friendly Pronghorns grazed on the grass around us while we strolled the pathway, and apparently, they get bobcats too. Insider Tip: Take one of the two-hour or four-hour tours so you can also see Dan Flavin's fluorescent pieces. My 48-hour time limit didn't allow, but you better believe it's a hight priority for next time. Why Go: While no one can deny the phenomenal artists throughout history, there's nothing quite like experiencing the creatives of our modern era. Contemporary art highlights important cultural moments and messages that are often more powerful than words. They bring our attention to the powerless or provide a megaphone to those without a voice and encourage the masses to see the marginalized. The Marfa Contemporary is a fantastic space for this conversation, and I was lucky enough to witness an installation view of the exhibition titled Annkaylli: Spatial and Ideological Terrain by William Cordova, which really challenges you to view art in a completely new way. Insider Tip: Speak with the curator or gallery attendant at the entrance. We would never have known that you could move around the exhibition, underneath it and even through it if we hadn't asked her questions or to explain the artist's goal for the exhibit. It really changed the whole experience. Why Go: It's the new hip and happening place to stay, but Hotel Saint George is more than just good looks. Houston-based Carlos Jiménez was inspired by the sites original hotel that dated back to the 1880s with a nod to modern times, of course. He enlisted the help of local design studio Silla to create the contemporary interior that could easily be at home in New York. Besides that, the service is impeccable, and the food at the hotel restaurant is delicious too. Insider Tip: The owner of the hotel, Tim Crowley, paid homage to the artistic town by filling it with paintings by local artists. They're everywhere. And you can also purchase them and other artwork at the in-house bookstore, Marfa Book Company, which is also brimming with art books, supplies, local offerings, and memorabilia. Check out a few more of my snaps in the gallery below, and then shop our editor's travel essentials. For more things to do in Marfa, check out Who What Wear's three-day guide. Everywhere you look there's a cool building packed with patina. This one was right next door to Marfa Brand where they make beautiful handmade soaps. They smell and look divine, and it's worth a look. I couldn't resist its hinoki soap dish and was tempted to walk away with its hinoki bath mat too, but the trek back would have been arduous. Shame. I fell in love with this oversize piece of art made up of small paint swatches all collaged together. This gorgeous building looked like it belonged in Europe. I loved the wire furniture out in the front too. A sweet and sunny spot to spend the afternoon, chatting and sipping on coffee, it's as though time stands still in Marfa. If I had my husband or son with me, we would have gone in for a trim at this cute barber shop. The building looked all boarded up and empty until you read the small lettering in the window that let you know otherwise. There are so many hidden doorways and holes in the wall like this. I love the inconspicuous nature of the town.